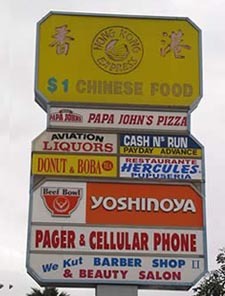 Sign for businesses at L.A. mini-mall. Proposed sign ordinance would limit digital conversion of such signs. Is it foolish to expect a business publication to produce an objective, in-depth article on sign regulations that are opposed by members of the business community? Or is such an idea, in an age when the line between advocacy and reportage seems increasingly blurred, hopelessly outdated? The article in point, “Stop Sign,” in the May 31 issue of the Los Angeles Business Journal, concerns a new sign ordinance that would prohibit all digital signs outside sign districts, and reduce the allowable number and size of new “on-site” or business signs. The ordinance was approved last year by the City Planning Commission, but hasn’t been acted upon by the City Council. The article, written by Howard Fine, is replete with unchallenged assertions and misleading and incomplete statements of fact. One of the most serious deals with a recent motion by City Councilman Paul Koretz to place what Fine writes is a “ban” on electronic signs in the Councilman’s district. In fact, what Koretz has proposed is an interim control ordinance, or moratorium, on digital signs while permanent regulations are developed for specific neighborhoods. A reasonable business person might be alarmed by “ban” but willing to consider regulations that take into account the effects of the signs on residences and issues of traffic safety and community character. Fine also reports without question the claim that a Ross Dress For Less that moved into a vacant store in a LaCienega Blvd. shopping center couldn’t have had any signage other than a pole sign if the new regulations had been in effect, because the other businesses would have used up the entire sign allotment for the property. In fact, the proposed regulations provide for a “Comprehensive Sign Program” which allows large shopping centers and other commercial developments to apply for increased signage, up to existing sign ordinance limits. During last year’s debate on the sign ordinance revisions, lobbyists and other business representatives argued that reducing the size of signs and limiting digital signs to sign districts would inhibit economic activity, cost jobs, and reduce tax revenue in the middle of a recession. Fine doesn’t examine these arguments, even though many examples of cities with strict sign size limits and bans on digital signs exist right in the L.A. metropolitan area. In writing the new sign ordinance, the city planning department looked at regulations in New York, Chicago, and other large cities and found that allowable sizes and heights of signs were much more liberal in L.A.
Is there a direct relationship between the size of a business sign and the amount of activity that business attracts? Does converting static signs to digital mean those businesses will all experience a significant increase in the number of customers? And if so, does that increase represent an overall boost in business activity, or just a shift in customers from one store to another? These are highly relevant questions, but Fine didn’t pose a single one in his article, instead giving the most space to quotes from a San Fernando Valley car dealer who says he can’t compete with dealers in other cities unless he’s allowed to put up a big, electronic sign along the heavily-traveled 405 freeway. Fine did mention the concern that digital business signs could create the same light trespass into residential neighborhoods as digital billboards. This issue was one of a list we provided to Fine prior to the publication of the article. Other issues of concern on our list were increased energy consumption by electronic signs, the potential for driver distraction and the fact the Federal Highway Administration is conducting a study, concerns about privacy raised by video cameras embedded in the signs and mechanisms for communication with those viewing them, and the important concern that the conversion of a large number of business static signs could significantly alter community character. None of those were mentioned in the article. Neither did Mr. Fine interview anyone in the City Planning Department who worked on the regulations, or members of the City Planning Commission who voted for it. But we’ll be charitable, and give him and his employer a D instead of the F they probably deserve. While the owner of Galpin pleads his case about losing customers to Carson and its sign(s), their website proclaims “#1 Volume Ford Dealer in the world for 20 years in a row.” The “poor me” argument doesn’t hold. Besides, do we really want a “sign war” so that for example Santa Monica & Culver City dealers “retailiate” with their own signs along the 10 freeway? Personally, I’m in the market for a car, and I’ve checked craiglist, websites, and newspaper ads. Hmmm, freeway signs seem to be missing from that list.